A beautiful candle set, chosen by NEW ZEALAND BRIDE & GROOM MAGAZINE as their favourite for our advertisement in the August 2011 issue. Carefully designed to tie in with the bride's wedding colours, this set features a celtic cross specially poured in the matching shade of purple. Only the most perfect examples make it onto the candles. The font and colour of the text were co-ordinated with the couple's wedding stationery. Please note the reversed order of the bride and groom's names on the side candles. 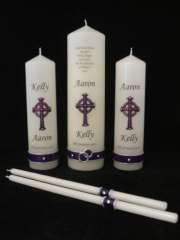 A matching purple wax band with silver wax edging finishes off all five candles including the long slim tapers. On the main candle the band highlights a pair of entwined silver wedding rings. Swarovski crystals ad extra sparkle. The main candle measures 250x65mm and the side candles 200x45mm. Presented in stylish gift boxes. The printed text is protected by a fine layer of clear wax and all decorations are hand-crafted in wax. To view another photo of the wedding, please see the Gallery.